We have all been embarrassed at one point or another in our lives. Some of us, more than others. Sometimes we are able to laugh it off. Sometimes we want to hide the rest of our lives, other incidents we just flat out deny. I used to be a denier…it catches up to you though. People don’t forget, doesn’t matter how much money, chocolate, etc…. you offer them. It is embedded in their memory forever. They laugh, they joke all at your expense. So, what if I wrote a book, a thick book…an encyclopedia-thick book about my most embarrassing moments. What if it was even in Oprah’s book club? Ha! I would call it, “Things I Accidentally Meant To Do,” or “Life! Before The Padded Walls.” Whatever, it’s my book, I’ll decide. It will have lots of chapters, (I will change the names to protect the innocent for enough money and chocolate.) Chapter one will be called. “Mr. and Mrs. Potato Head” It will be a tricky chapter as it will have 3 parts to it. While out looking for a new pair of slippers, I came across a Mr. Potato Head slipper. I jokingly told my shopping companion, (no name, gave me $ and chocolate!) “too bad there’s only one of those…I would have gotten them!” A lady, slightly older than myself overheard me and asked, “if I find the other one for you, you’ll buy them?” Uh-oh!!! “well yeah, if they’re my size.” She gave me the look, you know the…try them on you idiot before I dig through 3,472 mismatched slippers to find the matching Mr. Potato Head. Long story short, I got new slippers. Dumpster DivingSo I have my new slippers and quite honestly I grew very fond of them. I wore those little guys all the time. One night…one late night I, (living in an apartment complex at the time) took the trash out to the dumpster. I was, as usual on the phone. As I hurled the trash into the dumpster, so went the phone. What the….do I do now? (after a small conference with my ducks) it was clear I needed to go in after it. I went and got a patio chair from my porch. Hoping the person on the phone realized what had happened I encouraged them to keep screaming my name so I could find my phone. After all it was very dark and I didn’t want to spend a second longer in there than needed. I got in and got the phone. Just as I was ready to get out a car pulls in, next to the dumpster. O.K., be still, he will never see you… (I wonder how many rats are lurking below me ready to attack me?) I was grossed out. I was freaking out. The person on the phone, Deanna (she gave me no $ or chocolate) had hung up, the ducks were too smart to ever get in there in the first place. I was on my own. Just get out of your damn car already and go inside. I don’t know if he saw me or the chair outside the dumpster but something sparked his curiosity. “Hi” was all I could think to say. “You o.k?” he asked. “Yes, just dropped something.” Was the most intelligible thing I could think of. “Oh….” (so why on God’s earth are you still standing in there talking to me?) I knew I had to get out sooner or later…here it goes. Dignity? Pride? Gone! This man (and I would use his name if I knew it!) will always remember me as the 40ish year old lady who, in the middle of the night he watch climb out of a dumpster, clad in p.j.’s , one Mr. 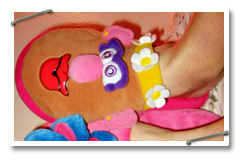 Potato Head slipper at a time! Off to Wal-Mart I go to get another pair. None. Another Wal-Mart. Zilch. The next, nope. But check this out, they had….Mrs. Potato Head!!!!!! ONE pair in MY size. I snatched the babies up faster than…well, I snatched them up fast. Tra-la-la-la la-la la! I got new slippers! We walked the store, than again. Honest to God, I was near tears. I think that is why they were so willing to go above and beyond to help me. The nice (but nosey) lady then gets a beep on her Wal-Mart walkie-talkie. Seems I need to be a little more specific about what these special slippers look like. Now, I have a choice…walk away NOW and never look back or tell these nosey associates my slipper business. I chose to tell. Hmmm mmm…she clears her throat. Amused and a little pissed at the same time, she relays the details on her Wal-Mart walkie-talkie. She assures me at that point they will keep their eyes open; they will call me if they find anything, yadda, yadda. What? Are they not helping me look anymore? Isn’t that their job?? It was right about then, I hear the announcement. It was loud, very loud and very clear. “Will the (annoying) lady who lost her (left) Mrs. Potato Head slipper (and had the whole flippen store searching for it as if it were a lost child) please come to the front of the store (so everyone can see who you are and laugh at you hysterically) we have found your slipper. A good author (or someone planning to one day write a encyclopedia-thick book, or be in Oprah’s book club) will keep you in suspense. I wish I was but I’m not. Many of you already know this, some may be figuring it out right about now and well, for the rest of you…here’s a heads up. So, I am out running errands. In one store out the next…. tossing receipts, change, candy wrappers, etc…. into my purse at each stop. Many of you already know this, I also have very sensitive eyes or at least I have convinced myself of this making it impossible for me to even take the trash out without wearing sunglasses. They are a must for me everywhere I go. I have my chic little NINEWEST glasses and my trendy DKNY shades. I really have no preference between the two; I keep them both with me and usually put on the first ones I can find. So, back to the errands. I am at my last stop, CVS (I had a $50.00 gift card for transferring 2 prescriptions there. Kind of like transferring a balance from one credit card to another for the perks, I do that with meds!) I’m walking through there like a bat out of hell, diet coke, cookies, post-it notes, magazines, all for free, free, free!! I get up to the register and proudly present my $50.00 gift card. They run it through and hand it back to me with $1.32 remaining on the card. As I’m walking back to my car I’m trying to figure out what I spent $48.68 on and I go into a full-blown panic… I cannot find my chic little NINEWEST glasses OR my trendy DKNY shades. Surely I could not have lost both pair…. surely. I dig and dig through the chaos surrounding me. Nothing! I probably was so excited about my free diet coke, cookies, post-it notes, and magazines- I walked out of the store and left them…at least one of them on the counter. I will just go back in there and I will get them. I rush back in (before I go blind) and look on the counter, nothing. There were a few people in line but they probably wouldn’t mind if I just asked the CVS checkout dude if he had found a pair of my sunglasses on the counter. Well, they obviously did mind as they all gave me a funny look. The checkout dude gave me a weird look too. (I think he was hoping I had came back in to spend my remaining $1.32) No, he had not found a pair of my sunglasses. Many of you already know this, I suffer from O.C.D. (obsessive compulsive disorder) but ‘hoarding’ has never been an issue. I have dealt with many symptoms but this has not been one of them. Well it may be an issue now. I climb into my car, (practically blind because my eyes are so sensitive) as the rude people in the store walk by me they continue to give me funny looks. Do I have a booger in my nose? Cookie crumbs on my face? Imagine the horror I felt as I looked in the mirror and found BOTH my chic little NINEWEST glasses and my trendy DKNY shades had been resting atop my head the whole time. Unfortunately it wasn’t while I was fishing! I was on one of my many trips to the river (way back when.) I had spent the day water skiing, tubing, swimming…you know, the typical river stuff. It was late in the afternoon, (by river ‘time standards.’) After strutting my stuff all day I was ready to sit, relax and have a cocktail. I carefully situated my beach chair (or is it a river chair when your at the river?) on the beach so I could soak up the few hours of sun that remained in my busy day. It is an unspoken rule at the river that if you’re going to strut your stuff in a micro bikini, one must look good. This means no uneven tan lines. Back to my story. I situated myself, my micro bikini and my cocktail in my beach/river chair. There I sat, alone. Everyone else was enjoying their cocktails in their beach/river chairs about waist deep in the water. Poor souls are going to have uneven tan lines I thought as the sweat poured off my evenly tanned body. It soon became obvious why they were in the water. As my cocktail was on the brink of boiling and my evenly tanned body was on the verge of dehydrating, I had to make a choice. Do I continue on with this near death experience and remain in the blistering 125-degree heat? Do I forfeit my even tan for my health? As my cup runneth over with my now boiling cocktail, I thought about my kids and how useless I would be to them as a piece of beef jerky. With that in mind…I repositioned myself and joined my uneven tanned friends in the water. Now, bear in mind this was a few years back…. So along with my even tan, and micro bikini, I also sported long, golden, curly tresses. Long and curly being the key words here. Now, one by one my unevenly tanned friends are deserting me, walking away rather briskly. Is it an issue that I have an even tan? Did the sound of my skin sizzling as it touched the water startle them? Perhaps they needed a cocktail refill? They inform me there was “something” in the water nibbling on their toes and bums. They have obviously had too many cocktails. I feel or see nothing in the water but the reflection of my evenly tanned body, micro bikini and long, golden, curly tresses. I secretly do a quick ‘pit’ check to see if my B.O. juice had failed me today. Negative. Damn fish tales! I recline my chair a bit, after all, I’m alone now, I can take up as much room as I want. I lay my head back and let my hair flow with the water. It feels so refreshing, I recline a little more. There is nothing biting my toes or bum…. but then again my unevenly tanned friends have probably had quite a few more cocktails than myself! They really need to quit drinking so early in the day! So now my hair is submerged in the water and I am looking up at the big beautiful blue sky. Silly friends. Silly, drunk friends I think to myself…. So now I feel my hair flowing but it’s not flowing with the water, it’s caught in a riptide. It’s being pulled to the left, to the right, down, out. Was the river swallowing me whole? Did I have more cocktails than I thought? I wasn’t going down with out a fight, I didn’t surrender to the sun and turn into a piece of beef jerky, I sure wasn’t going to let the river devour me whole. I have kids to take care of. It’s time to take control. I try to sit up but my hair (why do I always have the hair issues?) is caught in the treacherous seas. I reach my hand (bravely) into the waters to try and free my golden tresses. That’s when it happened. I felt it, it was bigger than life. It was a fish…. caught, stuck, devouring my hair. I somehow got to my feet, Jaws still clinging with all its might. As I swing my head side to side, looking as if I am auditioning for a White Snake video, doing moves I have only seen Gold Medal gymnasts do I hear a splash. I am free…I am in one piece…I am alive. (Which at this point I am not so sure this is a good thing) I look up at the beach and there stood all my uneven tanned friends. Doubled over, on the ground, roaring…. with laughter. I am beginning to think my silly friends, my silly drunk friends were not so silly or drunk after all. They warned me and they were right. My only relief from this was to know that I did not have B.O., they abandoned me for legitimate reasons. No longer do I have the even tanned body, the micro bikini, or the long golden tresses. I will however always have the memory…the horror of the day I caught a fish…in my hair!!! I had good intentions, I really did. My son had just started dating his girlfriend. She had been to our house a few times but we had never really had the opportunity to just sit, talk, and get to know each other. (This was probably my son’s way of protecting his new romance!) Well I’m the mom, and I needed to get to know this girl who had stolen my son’s loving heart! Rule #1: Do not cook. I arranged for us to meet at a local, casual restaurant. Rule #2: Be on time. I have a habit of running late, very late! But not this time, I was going to do my boy proud. Not only was I going to be on time, I was going to…are you sitting down….. hold on….. I was going to be…take a deep breath…. I was going to be early! What a good mom I am! So, I had good intentions. I didn’t make it early but I was on time, unlike my son and the girl who stole his loving heart. Now I was worried, I was on time, which meant I probably forgot something important. Wig? Oh my gosh! (just kidding) Check. Make-up? Better run to the Ladies room and double check, I probably have a minute or two before they arrive. So, I walk into the restroom and find they have no mirrors on the walls. What the freak…this place is obviously going down hill…. I then remember this cute little Clinque lipstick case that has a mirror in it in my purse. (I think my mom had put it in my Christmas stocking in 2004, no actually I think it was 2005 because it was the year I got my Karaoke. It could have been 2004 but if I had to bet on it I would say 2005.) Uh-hm, back to the story. I pull out my little mirror (that I got sometime in 2000)….. my wig was a little twisted so I fixed that, make-up looked pretty damn good if I say so myself. A little bit of lipstick and I was good to go….. just so happened I had some in my Clinique lipstick case! I could not move, hell I couldn’t even breathe. Still holding my door somewhat open, I just stood there. Me, in my straight wig, my perfect make up and my freshly applied lipstick. She somehow was able to maintain her composure. It was then a very nice man excused himself as he walked between us. I moved to the side to allow him to get by me. Oh dear God, this is bad. Should I run? Fake amnesia? Laugh? Cry? Break out into another hoedown dance? We were all eventually able to laugh about it. The more time she spent with us, the more she realized it wasn’t that crazy. It was just one more day in the life of Heidi! It had been a wonderful day. Weather was great, work had been productive…best of all, it was Friday. The weekends were always great. Every other one was spent with my sons, usually at the hockey rink. (They rock!!) Other weekends were spent with my friends. (I have more in real life than I do on myspace. We were both single moms so we felt we deserved a night out on the town every now and then. This particular Friday night we…no, she had an idea. She has got to be flippin’ kidding me. I did not get all fancied up in my fashionable jeans and cute shirts that gently hugged my curves to go to Ralphs. What could she possibly need tonight? Shampoo, to wash out all that goop she used in her hair to get that ‘just rolled out of bed’ look? Oatmeal, to eat in the morning to soothe her potential hangover? Maybe she didn’t want to go to Ralphs at all, maybe she wanted to go to a mall. Maybe she was jealous of my curves and wanted to get an even cuter shirt! “What kind of stuff?” I asked with much hesitation. O.K. I am completely oblivious to where this conversation is going. What kind of toy does she need? Can’t she do this on her own time? Toys…TOYS, oh dear God am I slow! “Ummm, where?” As I envision a dark seedy looking shack with a dark, velvet curtain that shields you as you enter. One that would have a perverted looking sales clerk, lurking at your every move. Now as hesitant as I am, I am now also very curious and intrigued by her sleeze ball idea. So off we went on our adventure! We arrived at a little shopping mall, all the stores looked decent and very well lit. Good sign! We got out of our car and made it to the entrance…alive. Another good sign! We walked in to what I would describe as the Nordstroms of ‘toy’ stores. It was very tastefully decorated. Sales clerks were dressed pretty reserved…considering. “She wants a toy!” I immediately informed the first person I encountered, who by the way did not even work there. “Nice” she replied as she looked at me with much confusion. As my friend continued her shopping adventure, I wandered around in the “R” section. (Maybe R+) They had pretty, little nighties. Some interesting lotions, oh and handcuffs (?) Those must be for the customers that get out of control….oh dear God, please let my friend behave herself!! She soon caught up with me in the “R+” section. “O.k., good,” as my face turned redder than any boa in there. I had minimum curiosity about what IT actually was. We safely made it back to her car, me, my friend and IT. We then decided to hit a local hot-spot, (no pun intended) have a few appetizers, cocktails and shake our groove thang!! As usual we ran into a few friends, a few acquaintances and made a few new friends. We were having so much fun, I had forgotten about IT! We danced into the wee morning hours. So, now it’s time to leave the local hot-spot. Of course being two girls in fashionable jeans and cute shirts that gently hugged our curves we could not chance walking out to the car alone, so a few of our new and old friends offered to walk us out! What nice friends we have! We all made our way out to the sparsly filled parking lot and found our way to the car. It was late and I was anxious to get home and get a good night sleep. My friend was anxious to get home too, probably for different reasons though, she had a new friend, she had IT! We said our good-byes, chit-chatted and laughed some but now I’m getting irritated. Enough is enough, I am tired and all I want to do is take my fashionable jeans and cute shirt that gently hugged my curves off, put my jammies on and sleep! I decided that maybe if I get in the car (I was riding shot-gun) they would all get the hint, including my friend and we could leave. I said my good-byes to my irritating friends, old and new, and opened the door to climb in. What happened next could not have happened the way it did even if it was orchrastrated. Not in a million years. Not Ever. Something Criss Angel could never pull off. It was as if it happened in slow motion. O h . . . n o ! ! . . . k e r – p l u n k. . . w h a t . . . t h e . . . f r e a k . . . s h o o t . . . m e . . . n o w ! ! “Heidi, oh my gosh, aren’t you embarrassed?” as she laughed hysterically. So now I am walk to a back room for privacy, this wasn’t going to be an easy call. Blushing like a 14 year old girl who was talking to a boy for the first time, I continue. Thinking about my then husband I replied, “Naw” as I break out in a heat flash. My family, now standing in a circle holding hands can’t possibly reconize the scream. But before my son hit the button my conversation with this raunchy D.J. dude proceeding the scream, played in full. You could hear a pin drop. I take a quick glance at my then husband, who’s expression confirmed still, I am getting squat for Christmas. The conversation which seemed to last forever finally ended. I try to play it off, but they knew, they all knew. It was on thing I acted like a 14 year giddy girl flirting with a raunchy D.J. dude, it was a whole different story I was calling to request Big Balls. My phone rings, it rings again….and again. Seems everybody was tuned in to KXXX this wonderful Christmas morning. Sweet, innocent Heidi’s cover had been blown. Some have never acknowledged the incident since, others…well, I will never hear the end of it. 5 Responses	to “ TRUE STORY!! ok i soooo remember the dumpster story!! I think you were on the phone with me?? lol you crack me up! Only my sis!!! That was pretty freakin funny!!! I can totally picture it too… Knock knock??? very cute, and she loves you to this day!!! your a great mom and your kids love you, which is a great thing!!!! Stick to the great work! Anticipate reading more from you in the future. I think it is going to be also good if you add “send to email” tool therefore people can easily forward the posts to their friends easily. For #3 “Toy Story”: OK, what was “it”?? ?